This tulip bears solitary, geranium-red bowl-shaped flowers on sturdy upright stems which have several leaves. The tulip has been the favored spring bulb for centuries. 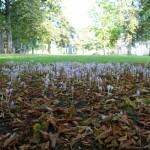 Thriving where summers are dry and winters are cold, this bulb is treated as an annual where summers are hot and long. A genus with around 100 species, tulips are divided into 15 distinguishing divisions. Best planted in large drifts, tulips can be used in rock gardens, containers, overplantings above perennials, forced indoors, and used as a cut flower. Make your selections according to what zone you live in. Largest selections are available for zones 4 to 6, fewer for 7 to 8 and bulbs grown as annuals in zones 9 to 10 must be pre-cooled at 40 to 45 degrees, 8 to 10 weeks prior to planting. Plant in fertile, well-drained, neutral to slightly acid soil where they will receive full or at least afternoon sun. In zones 7-10, plant in shady spots or where only morning sun is received. Plant between 4 and 8 inches deep as soon as early fall in zones 4 to 8 or late winter in zones 9 and 10. If you live in an area where your tulips will be perennial (zones 4 to 6 and sometimes 7), work bonemeal or bulb booster into or around planting hole according to label directions. While growing, water periodically, fertilizing with a liquid fertilizer every 4 weeks. 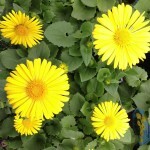 Once flowering is complete, remove spent flowers and allow foliage to yellow and wither for 6 weeks prior to removing it. Greigii and Kaufmanniana Group tulips may remain in the ground for several years, where other groups may be removed annually and stored in a warm, dry place. Replant the largest bulbs the following year, allowing smaller bulbs to grow out in nurse beds.